What's that you say? The oil is our livelihood? Here is another proscribed psychological operations leaflet from Iraqi Freedom. 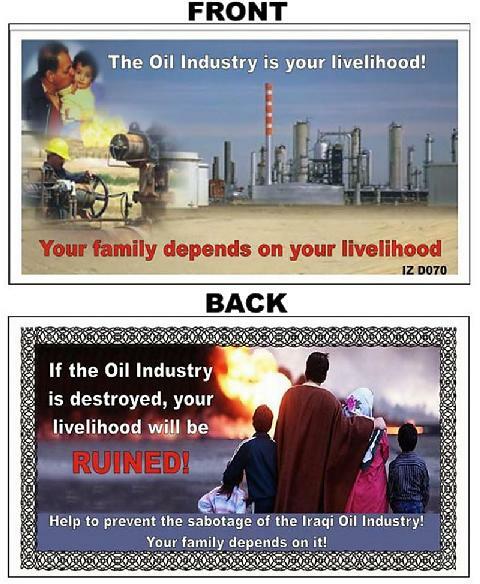 It warns Iraqis not to meddle with oilfields or their "livelihood" will be RUINED! It is impossible to know exactly why the US military has yanked this one from its official history of Iraqi Freedom, but we can proffer a few guesses. First, everyone was suspicious before the war broke out that the United States was just coming to get Iraq's crude for itself. The cynical might read this leaflet as just a ploy by the military in hopes that it would lessen the amount of mess to be cleaned up when it seized the oilfields for the U.S. government. But perhaps that is too uncharitable. Maybe it was removed because one of the thorniest problems facing the occupying power is that so many Iraqis don't have a "livelihood." And they most certainly are not now getting a piece of the oilfields, oilfields which they did not destroy during the invasion. Oil pipelines are now sabotaged as a consequence of the occupation. Or maybe it's simpler: The picture of an Iraqi family standing in front of a burning oil installation like it's a campfire outing was just too ludicrous.